Yesterday on their social media pages Milwaukee teased us with news that a new M12 Fuel tool would be announced today. If you were one of those that guessed it would be a new Hackzall, you were right. 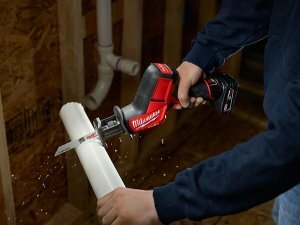 Milwaukee's portable 12-volt saw will now be part of the brushless family. So what can you expect from the new brushless Hackzall variant? According to Milwaukee it delivers 4x more run time, 70% faster cutting and 6x longer tool life. They even say it can best some 18V competitors. Whether these numbers are accurate is yet to be seen, but we know that a brushless model should typically outperform a brushed model. Like other Milwaukee Brushless tools, the M12 Fuel Hackzall uses integrated circuitry (aka Redlink Plus) that provides full-circle communication between the Powerstate Brushless Motor and the Redlithium Battery. This system ensures that you get the most runtime and life out of the battery and the tool. The M12 Fuel Hackzall will be available this May as a bare tool (2520-20) and as a kit (2520-21XC), which includes the saw, (1) 4.0Ah Redlithium XC Battery, a charger, a blade, and a contractor bag.